Honest, sustainable products, which incorporate an individual, modern design style, as well as harmonising functionality – that is what the label DISSELHOFF stands for. Furthermore, it is the first accessories-label within the premium segment to consider organic requirements for livestock breeding, in addition to leather production itself. At the heart of the design philosophy are strong personalities who emphasise their individuality with style and at the same time place value on good working conditions, fair pay, short transport routes and animal welfare. All products in the collection are handmade with great attention to detail and ensuring fair conditions in selected manufactories in Germany, Italy and Switzerland. Unique and functional details are the signature of the label DISSELHOFF. The high quality and handcrafted stainless steel clasp impresses with a particularly innovative locking technology. 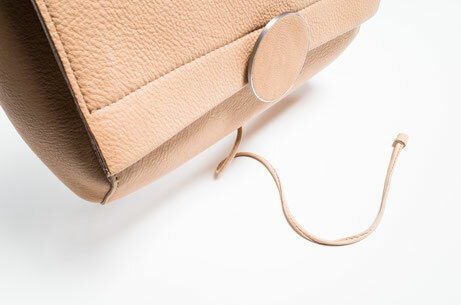 Using a leather band, which is wrapped around the closure, the bag can be closed in the twinkling of an eye. The closure may be used in a modular manner, and is easily exchangeable for another design, simply by unscrewing it. The splints and soil nails are also made from stainless steel, and are handmade in Germany. Another highlight are the wooden elements used. Made from native beech and hazelnut, the handle elements are extremely beautiful, whereby the pattern of each one is absolutely unique. 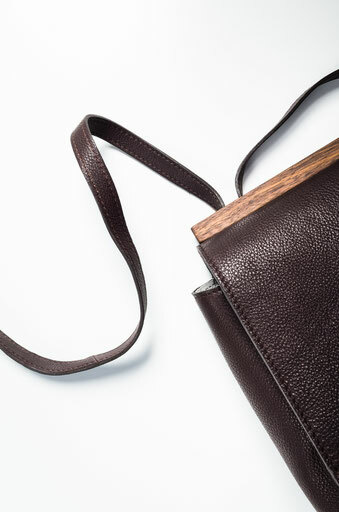 The shoulder strap is pulled through the wood and has a sophisticated adjustment under the flap. This allows the strap to be adjusted in length and optimally adapts to its wearer. The wooden elements are produced in a small, owner-managed carpenter’s shop in Germany.